The 6 Kalmas of Islam 2017 is an application in which people can recite the Kalimas of Islam with perfect pronunciation and translation. 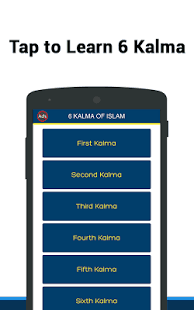 The Application inculcates 6 Kalmas that are obligatory upon every Muslim to learn by heart. 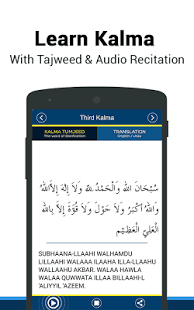 This particular application makes the process of learning these Islamic Kalmas by heart very easy and convenient. The App includes Six Kalimas in Arabic and English and Urdu translation and transliteration with interactive interface. Download this incomparable App and learn 6 Kalima of Islam to extract the blessings in order to learn the real essence of Islam.